But also, I want to do what I KNOW is right for our students. What I KNOW will bring them long-term, sustainable results. And although I want to make a living doing what I’m doing, I wouldn’t be able to put my head on my pillow at night if I were charging money for a service in which I’m tricking people into thinking they’re making progress when they’re only spinning their wheels. Why do we have a gym? We truly believe in personal connection. That’s why our studio is small. We don’t want classes of 30 or more. We want fewer than 12 people in each class and we want to make sure everyone is getting the most out of their training session, getting the personal attention they need, and staying safe and injury free. We also know that by building a community, we’re stronger together. We’ve hiked, collected gifts for families for the holidays, and done fundraisers for friends in need. In this ever-growing virtual world, there’s still nothing like connections with real humans. Why do we focus on strength? And what I’ve found with many students is they either believe they’re strong or they think they’re not. And a lot of times, those ideas are based on the presidential fitness test they performed in middle & high school. The problem is, no one ever took the time to TEACH them how to be strong. The test was… can you do a pullup or a pushup? The answer was: Yes or no. The truth is, strength is a skill that can be taught to everyone! Yes, some people have more natural ability in the area of strength, but EVERYONE can build strength. And when you build strength, doors start opening to things you never thought you’d be able to do, physically (and mentally for that matter… but that’s a whole other blog). Why do we want to be strong for life? It’s popular now to be strong for a day – to push yourself to exhaustion and post on facebook about how you’re “so sore” you can’t train for another week. But when you think about that – you just lost a week of training! I think we get that because we watch athletes on TV who are pushing themselves in professional sports games, the olympics, marathons, etc. We see people falling at the finish line or pushing themselves to the brink and either winning the gold or getting injured. We want to be like them! But real athletes may push themselves to the brink once, MAYBE twice a year. And the stakes are high – they make their living competing in the sport or off endorsements from winning. They spend the majority of their time training moderately and pushing themselves every so often, in a very calculated way. Most of us will never be in a situation where we’re being paid for a sport. But we can learn something from these athletes – to be in the best shape YOU can be in, train moderately most of the time, push yourself every so often, and train for something & challenge yourself once a year if you feel up to it. That doesn’t mean we don’t work hard. Come try a class and see for yourself. It just means we’re smart about the way we design and implement our sessions. We want you to feel BETTER when you leave than when you came in, NOT beat down & exhausted. We train the way athletes REALLY train, not how we see athletes compete. Our TRX & Foundational Strength Classes are a good starting point. Come to these classes to sweat, stretch and learn the foundations of building strength. If you’ve never done kettlebells before, the TRX is a great place to start.  If you’d like to try kettlebells, email me at valerie@pacstrength.com & we’ll set up a time to get you to the gym to learn the kb basics!